What have the fundamentalists done with our heritage? 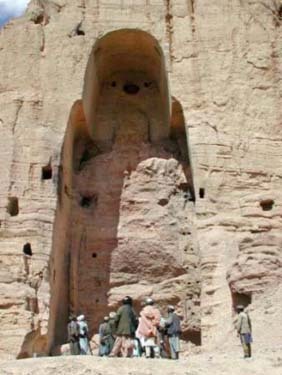 55m;180 ft; created in the 3rd century A.D.
LONDON: Relics of the 2000-year old Bamiyan Buddhas, blown up by the Taliban in March in the face of global criticism, have now been put on sale in Peshawar. At least 10 truckloads of pieces were driven into the tribal areas between Pakistan and Afghanistan last week and approaches are currently being made to dealers, the Sunday Telegraph said. Large parts of the colossal statues, as tall as 170 feet, were reduced to rubble. 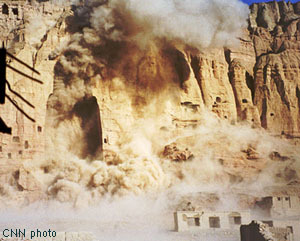 The remainder has now been put on sale by intermediaries for the Taliban. One of those contacted was George Bristow, a leading British dealer in Pakistani and Afghan artefacts, who was approached by one of his regular buyers in Peshawar, the paper said. "They tell me that there are many recognisable pieces and that some can be put back together," Bristow told the newspaper. "Some pieces are very much smashed but there are many still complete. 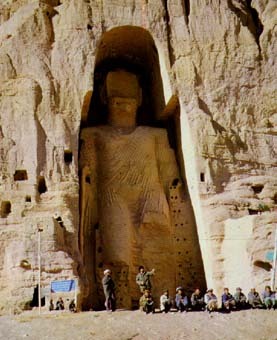 The Taliban blew up the biggest statues to show the world they meant business but there were other pieces and they are selling off the rest," he said. Among the complete artefacts offered to Bristow was a Gandhara Buddha of almost human height in black schist (crystalline rock) and parts of friezes.